Backup. Check. Burning. Check. But can it outshine Toast? With a name like Roxio Popcorn, one feels compelled to like this program. Its name conjures up images of settling down in a nice comfy multiplex seat, while munching on a bucket of popcorn and watching a good movie. There's definitely a hint in the name that Popcorn is good for copying movies... wink wink. Well, you'd be forgiven for thinking that Popcorn is some sort of video pirate's secret tool. But if you think that it can copy your DVD collection, then you'd be wrong. This program can't be used to copy the DVD movies you have lying around on your entertainment shelf at home. All commercial DVDs sold in this country are protected with an anti-copying device known as Macrovision encryption. This is used to deter pirates from copying commercial DVDs and selling them down the market. Anyone who's visited a market recently will know that the encryption isn't wholly successful, and that's because there are third-party programs that can rip the content of a DVD. 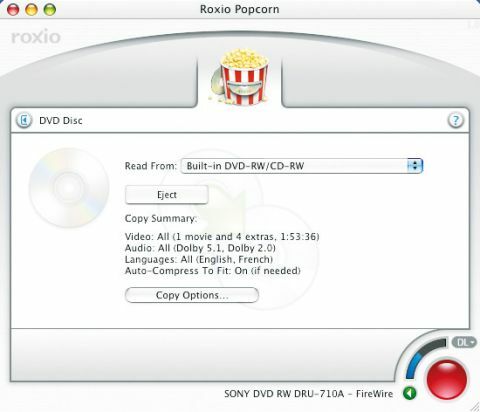 However, DVD ripping software is illegal, so Roxio can't include that element in Popcorn. However, assuming you could rip the contents of a DVD using one of the available DVD ripping programs, you could then use Popcorn to compress a 9GB DVD onto a regular 4GB DVD-R. But really! What's the point? Do you need to back up your DVDs? In fact, the only other use we can think of is to copy your own iMovies, iDVDs or DVD disk images. But hang on a minute! Roxio's Toast can do all that. Toast Titanium can do that and more. The only thing it can't do is the compression of the video.